Barstool Comforts specializes in custom, made-to-order bar stools for the homeowner looking for high-quality, long-lasting furniture at a great price. We're proud of our expertise, and we want you to have it at your disposal. Our free guide will make designing a bar stool that completes your room or outdoor space straightforward and stress-free. In it, we'll take you step-by-step through the process of selecting a bar stool you will absolutely love. 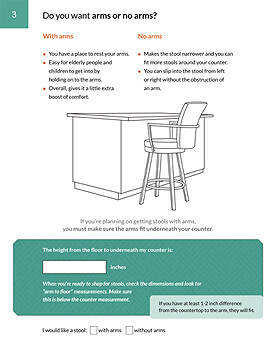 ^ Preview page of our guide, walking you through the steps of measuring your counter to determine seat height. Maybe you've been shopping online for bar stools for a long time, or maybe you just started looking. Either way, you've probably noticed there a lot of options to choose from. Don’t let this overwhelming feeling keep you from finding the right bar stool for you. Get this step-by-step, simple 13-page guide now. and designing bar stools for your home. Our free guide is designed to help you get the basics of what you're looking, and then help you pinpoint the exact options you want to showcase in your home without the stress. With all of our years in the business, we know how important great customer service is to our customers. 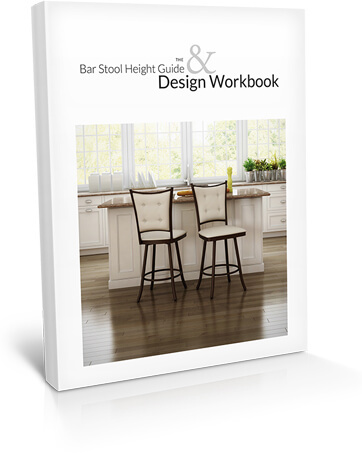 Our free guide is one of the best ways we can think of to assist you in taking the guesswork out of buying new bar stools, like measuring for fit, determining if you want a back or a backless stool, which type of swivel is best for you, and more. Once you've got that done, then the real fun of choosing colors, design and features begins. But don't worry... If you get stuck, we'd be happy to assist you with any step of the process.